"Don't ever question who can defy the odds," Shannon Keith, president of Animal Rescue, Media & Education (ARME), told The Dodo. Keith is referring to Chi Chi, whom The Dodo first covered in late February, several weeks after she had lost all her paws and was undergoing rehabilitation in preparation for moving into a forever home. After two months of hard work, Chi Chi is finally ready to start her new life. Nobody expected this storybook ending for Chi Chi, named after the Korean word for "loving." 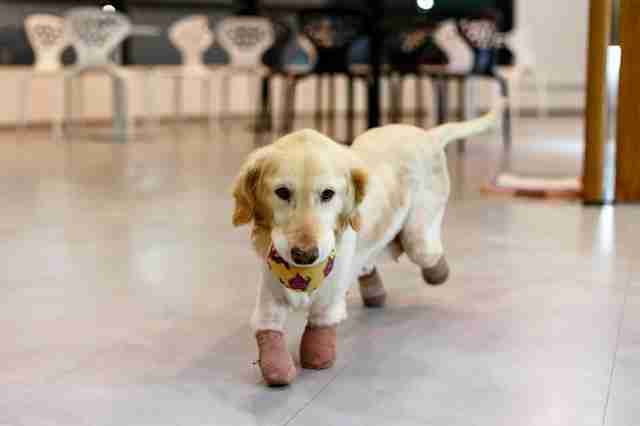 She was rescued from a trash can outside a dog meat farm in South Korea, where she was hung upside down by her paws and stuffed with food to make her gain weight quickly. "[Dog meat farmers] like [the dogs] to be scared before they die, because they think that makes the meat taste better," said Keith. "The more torture the more tender the meat." Unfortunately, it's a world that too many dogs endure, Keith explained. "People are very surprised that dog meat is still eaten in many parts of the world, even the United States." Keith, who also happens to be an attorney, is working with lawmakers to create legislation to ban dog meat farms in the United States. If successful, she will keep more dogs from receiving the same the cruel treatment as Chi Chi once did. "We weren't even sure she was going to live," said Keith. "The infection in her legs was so horrific it had eaten away her legs and it [had spread] throughout her whole body." The first hurdle for Chi Chi was simply staying alive after her quadruple amputation. 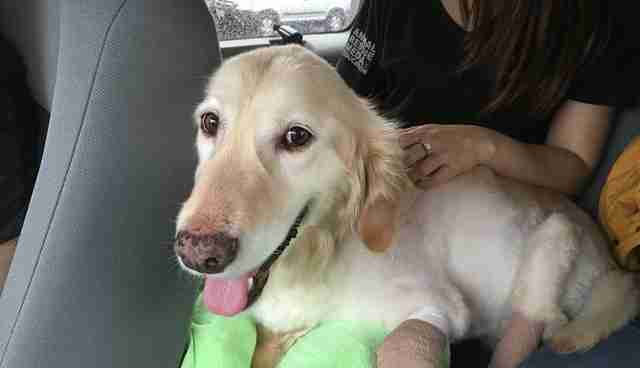 "She survived and the day after surgery she was trying to walk. She was smiling and wagging her tail," Keith continued. "Then, a couple days later, she even started walking on her little stumps." 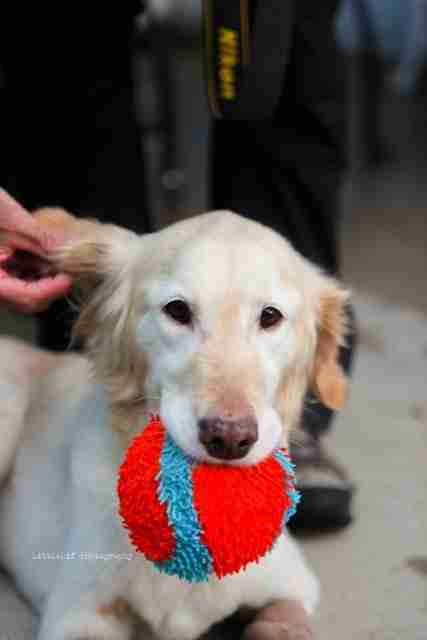 All her hard work paid off, because last week Chi Chi was finally ready to come to her new home in the United States. After months of video chatting with the pup across seas, Keith greeted Chi Chi when she arrived at the Los Angeles International Airport in California. 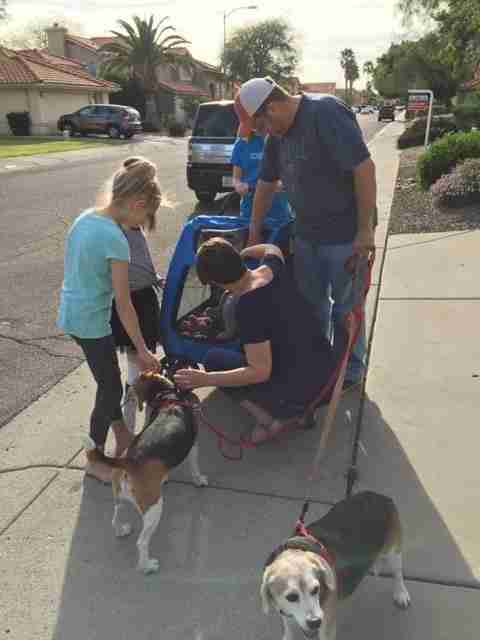 From there, Keith drove Chi Chi to her new home in Arizona. 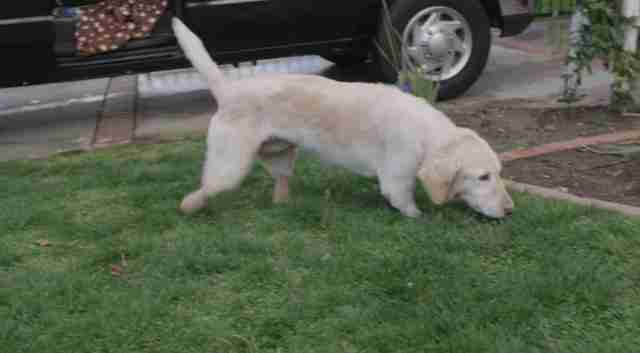 When they got out of the car, Chi Chi felt and sniffed grass for the first time in her life. She also had another big first: meeting her new family, Richard, Elizabeth and Megan Howell. The Howells have two other dogs who were happy to meet Chi Chi - Kipper and Harry, who were both rescued from laboratory research facilities through a subset of ARME called The Beagle Freedom Project. ARME set up an Amazon Wish List for Chi Chi to help her settle into her new home, and people who heard her story have been eager to show their support. 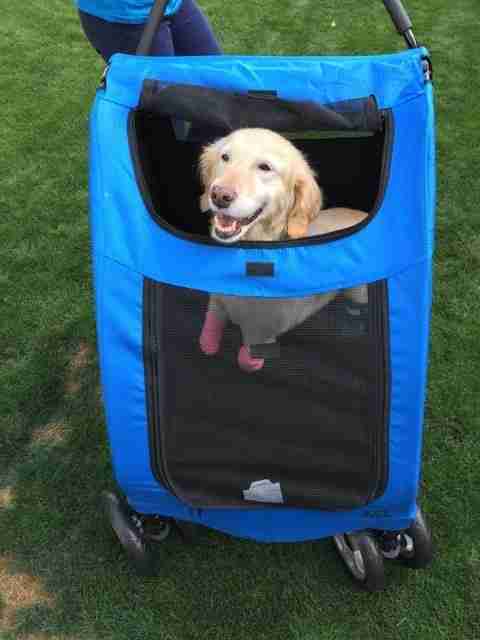 "One of the great things somebody got for us was a dog stroller," said Keith. "She's just in heaven. She loves it." Not having any legs doesn't stop Chi Chi from getting around on her own. "She can walk. She can run," Megan Howell told the Associated Press. She can do anything a dog with four legs a can do, "except go up the stairs." But Chi Chi has a fiery energy and she surprises everyone around her with her eagerness to move. "Yesterday morning, we were sitting there in [the Howells'] backyard," Keith recalled. "I was sitting on a ledge, and she jumped up on it," said Keith. "I was like, 'What?! 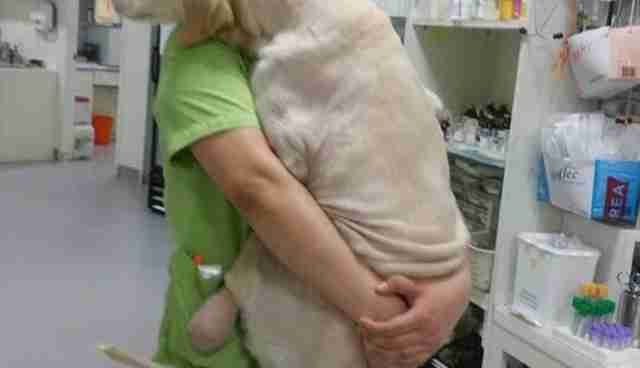 This dog is amazing!'" 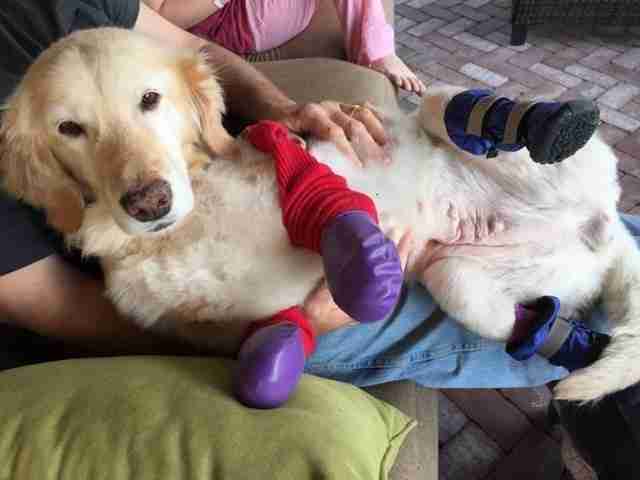 A veterinarian who specializes in prosthetics will be visiting the Howells this week. Her new footwear may take some getting used to, but if her eagerness is any indication, Chi Chi will face this new chapter with just as much energy and excitement as she has shown throughout the last two months. Thanks to ARME, Chi Chi's best days are still ahead of her as she grows closer with her new family and discovers how it feels to be part of a family that loves her as much as she loves them. To learn more about other success stories from ARME and to support its efforts, visit its website.